Anyway, if inspiration is wearing rather thin read on. I guarantee that by the end of today's post you'll have gift ideas for someone. First up is something for the person you can never think of anything to buy for. You know... him! Don't just get socks. Not when there's an entire site called Presents for Men chock full of ideas and gifts for every budget. There are things on there he never knew he needed. But once he's opened them - from you - on Christmas Day he'll wonder how he ever coped without them. Take this gadget wristband (£9.99) for example. Who'd have thought that this was just the thing to hold your phone while jogging? Or this - a ring that attaches to your phone (£9.99) to stop it falling our of your hand as you take pictures. If, like me, you use your phone as a camera you'll be only too aware of how vulnerable it is as you hold it between finger and thumb lining up a the best shot. I've tried a variety of cases to increase safety, including a really lovely wallet-style case with wrist strap. The problem with that is the case is so thick it casts a shadow on any photo. This is the solution to the problem... and it's so simple. I want one! Oh hang on, I'm supposed to be searching for inspiration for other people's presents. That's the trouble, I suppose, with Christmas shopping. A morning's idle browsing and I've got a fairly hefty wish-list of my own already! If the batteries run out on those expensive toys, there's always Pocket Cricket™ to keep the kids amused. (£9.99) and should this winter be cold as forecast, how about a Polar Bear inflatable sledge (£14.99) which has the advantage of being (a) more comfortable to sit on and (b) easier to store. And talking of socks (or stockings) - if you're looking for something small to fill them, Weanie Beans might just have the answer. The 'independent award winning coffee company' with innovative and quirky productsincluding a range of coffees, hot chocolates, confectionery and kits has some great gift ideas at a range of prices including mulled cider and mulled wine spice bouquets. Ah yes, bouquets. Bouquets always make good gift ideas but did you know that Interflora did a good deal more than flowers. For example, the Merry Christmas Tray (£29.99) contains delicacies such as moist fruit cake, luxury chocolates, crumbly shortbread and a couple of bottles of red or crisp white wine. And after sampling that lot, how about settling down for an entertaining read? If your man's into Motor Sport BBC Books have just published a spoof biography of The Stig. Award-winning biographer Simon du Beaumarche has spent a year chasing The Stig and talking to those closest to him including Jeremy Clarkson, Richard Hammond and James May and leading figures from Formula 1, music, movies and the military. What he discovered is an explosive story of intrigue, influence and a sensational conspiracy that seeks to hide the truth about one of the 21st century’s greatest icons. Now you might have read this far without finding anything that takes your fancy; you might have already got the man in your life the thing he wants best (answers on a postcard). Or you might simply want help saving money on the kid's presents. If so, read on just a little bit further. I guaranteed there'd be something for everyone and here it is: idealo.co.uk. If you've not heard of it before I reviewed the site last year: the service is cheap, quick and a one-stop-shop for shopping around. But the interesting thing about last year is this: their research shows that it was actually up to 24% cheaper to buy online through Idealo in the week before Christmas than earlier. So if last year's trend replicates itself this year, it would be considerably more expensive to buy toys now than the week beginning 10th December 2012. Of course, the risk is getting the presents in time for Christmas. Which is where those new sorting offices might come in. Remember them? Eight new sorting offices specially to handle Christmas parcels. But if you'd rather not risk it you needn't worry, as you'll still get a good deal from Idealo. 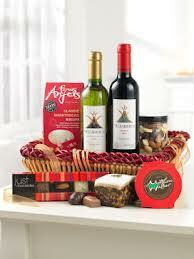 Gift baskets of wine and goodies, and a package of striped socks are now on the top of my list. Cheers! What is Charlie wishing for this year?